i-Build.PH Web Solutions and Services has recently helped assist a client with a major web design and development project for one of Philippine’s leading guns and ammo company of the country. 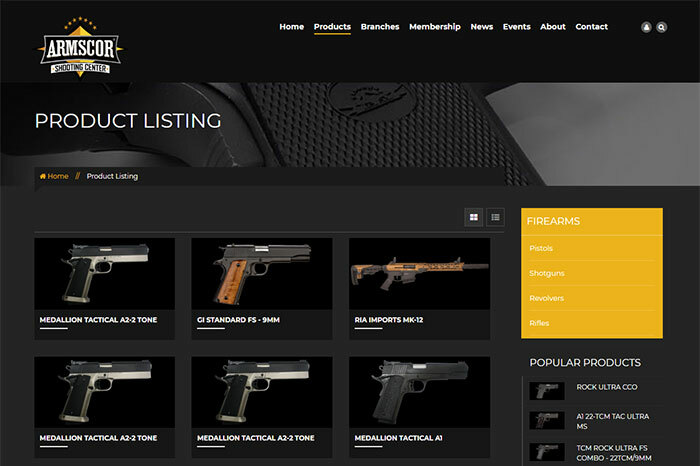 Armscor Shooting Center, Inc. (ASCI), long considered to the best and one of the most reputable guns and ammo company in the Philippines, has recently launched its new killer website. The website intends to promote the locally based parent company, ASCI, to promote its branding as a corporate presence with over seven guns and ammo stores and firing ranges all over the Philippines. ASCI has branches, stores and firing ranges all over the Philippines with branches located in Metro Manila –Makati, Marikina; in Luzon – Tarlac, La Union, in the Visayas – in Metro Cebu; and in Mindanao – Metro Davao. The stores cater guns and shooting enthusiasts with a reliable product ranges of guns (both locally manufactured and imported), ammunition, parts, accessories, and apparels, while the firing ranges offer a convenient venue for shooting practices both for personal or professional experiences. Visit the ASCI website here http://www.armscorshootingcenter.ph/. You can also view our other projects and clients in the Portfolio section of this website.